Vitruvian Man is a pen and ink drawing on paper that Leonardo completed in around 1487. 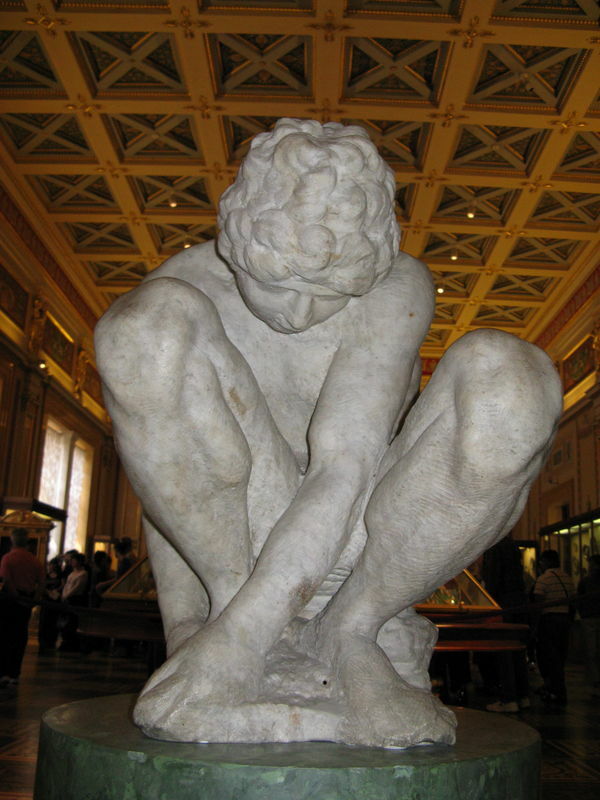 It depicts a male figure fitting his body into two distinct areas - a circle and a square - and he does so by altering the position of both his arms and legs. This drawing and its accompanying notes are evidence of Leonardo's knowledge of the proportions of the human body and are often referred to as the Canon of Proportions or, sometimes, Proportions of Man. Inspired by the writings of Marcus Vitruvius Pollio - better known as Vitruvius - a renowned Roman architect, Leonardo spent a great deal of time studying his books on architecture which were some of the only teachings of their kind to exist during the Renaissance. In Book III of Vitruvius' treatise De Architectura, which focused on the proportions of temples, he states that such places of worship should be based on the proportions of man, as the human body is the model of perfection and this is proven by the body's extended arms and legs fitting into the ideal geometric forms - the circle and the square. Agreeing with the notion of the human figure as the primary source of proportion, Leonardo named his drawing in honor of the architect. Eager to elaborate on his ideas, Leonardo dedicated much of his life to establishing links between the composition of the human body and other models in nature. Vitruvian Man could also provide insight into another problem that Leonardo tried to solve during his career - that of 'squaring the circle', which entailed drawing a circle and square that have the same area without calculation. 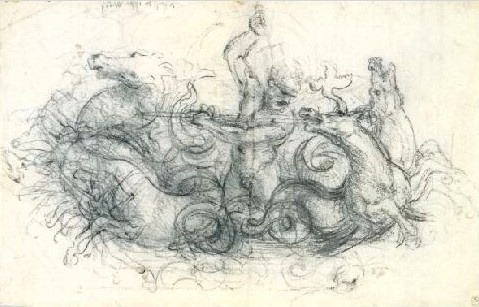 Some claim that this sketch shows that Leonardo had a mature understanding of the problem, which others would not develop until much later. Leonardo believed the functions of the human body are equivalent to those of the universe and since its creation, Vitruvian Man has frequently been used to represent the fundamental symmetry of the human body, and the universe overall. The ideas expressed by Vitruvius in his writings actually date back to the age of Pythagoras, who lived at the same time as Buddha and, like him, regarded life as an endless cycle of rebirth and a quest for purification and a return to our divine starting place. 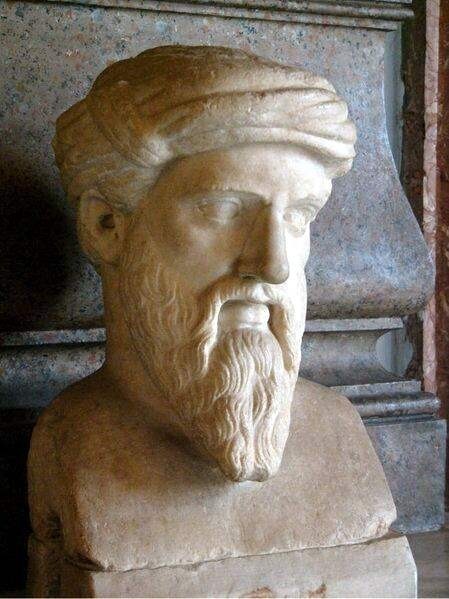 Believing in a connection between music and numerical order, Pythagoras taught that numbers also had characters and that geometric figures were significant magical symbols. The circle, he argued, related to the sky and the cosmos and was also a representation of the soul. Furthermore, the square was the way in which humans connected to the natural world and this explains why the number four is used to determine the seasons and elements, and so on. According to Pythagoras, if a human fits into both the circle and the square then this is geometric proof of their dual disposition. Such teachings found their way into the Renaissance thanks to their incorporation into alchemy and other fields. 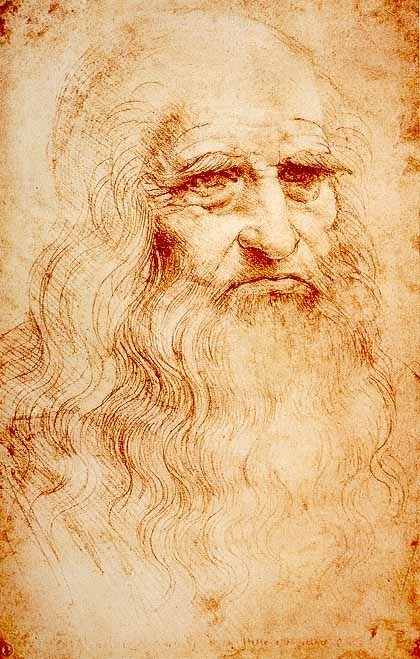 Adopting these views, Roman architect Vitruvius described the perfect human form in geometrical terms, and provided inspiration for numerous Renaissance artists but it was only Leonardo da Vinci who succeeded in correctly illustrating the proportions outlined in Vitruvius' De Architectura. Leonardo's Vitruvian Man combines his understanding of such teachings with his unique observations of human bodies. In his drawing he clearly demonstrates that the square has a lower center than the circle, lower down on the body. Such knowledge helped distinguish Leonardo's drawing from previous depictions. Departing from Vitruvius, however, Leonardo's extended arms mean that the fingertips are equal with the top of the head and do not form lines passing through the navel at an obviously lower point, as they do in Vitruvius' work. 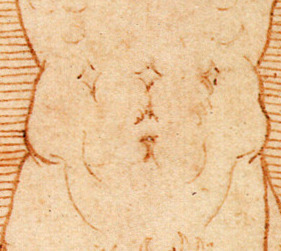 Furthermore, Leonardo has marked the bottom of his image with fractions to determine the sections of the body. Vitruvian Man is not only a demonstration of Leonardo's interest in proportion and his attempts to relate man to nature but it also showcases the blend of art and science that was prevalent during the Renaissance. Today regarded as a cultural icon, Vitruvian Man is one of the most noted drawings in the world and has appeared on everything from the 1 euro coin to text books and clothing. Vitruvian Man has also come to represent alternative remedies and denotes medical professionals and establishments worldwide. 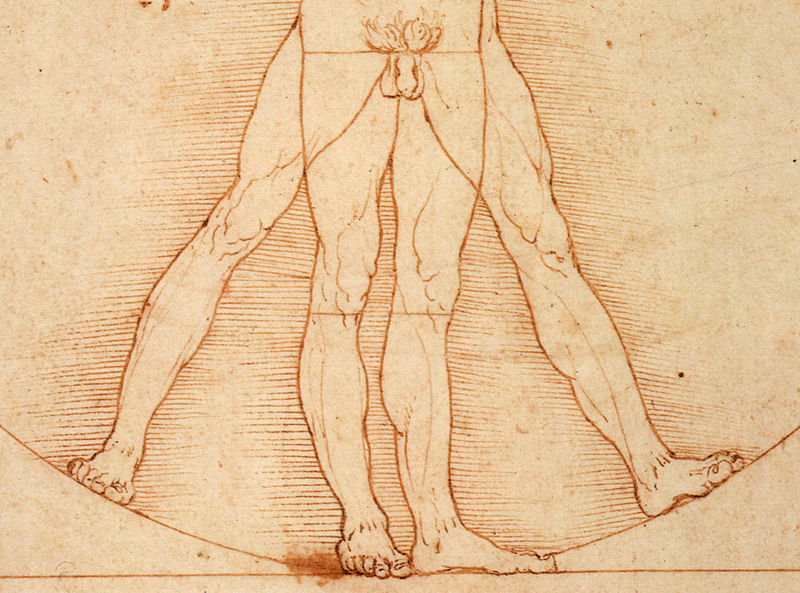 According to Keele, "Leonardo's famous drawings of the Vitruvian proportions of a man's body first standing inscribed in a square and then with feet and arms outspread inscribed in a circle provides an excellent early example of the way in which his studies of proportion fuse artistic and scientific objectives. 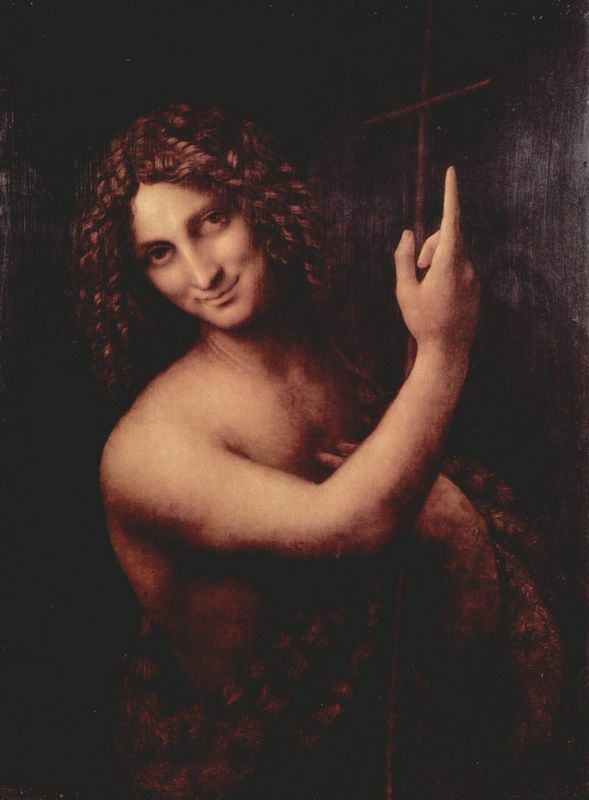 It is Leonardo, not Vitruvius, who points out that 'If you open the legs so as to reduce the stature by one-fourteenth and open and raise your arms so that your middle fingers touch the line through the top of the head, know that the centre of the extremities of the outspread limbs will be the umbilicus, and the space between the legs will make and equilateral triangle' (Accademia, Venice). Here he provides one of his simplest illustrations of a shifting 'centre of magnitude' without a corresponding change of 'centre of normal gravity'. This remains passing through the central line from the pit of the throat through the umbilicus and pubis between the legs. Leonardo repeatedly distinguishes these two different 'centres' of a body, i. e., the centers of 'magnitude' and 'gravity". 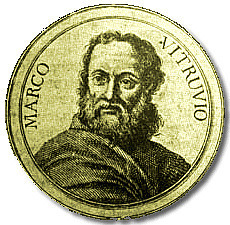 Vitruvius inspired many artists throughout the ages. 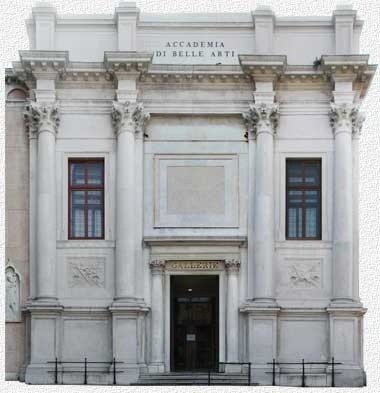 Cesare Cesariano edited the important 1521 edition of De Archtectura by Vitruvius and as a result created his own illustration that same year. 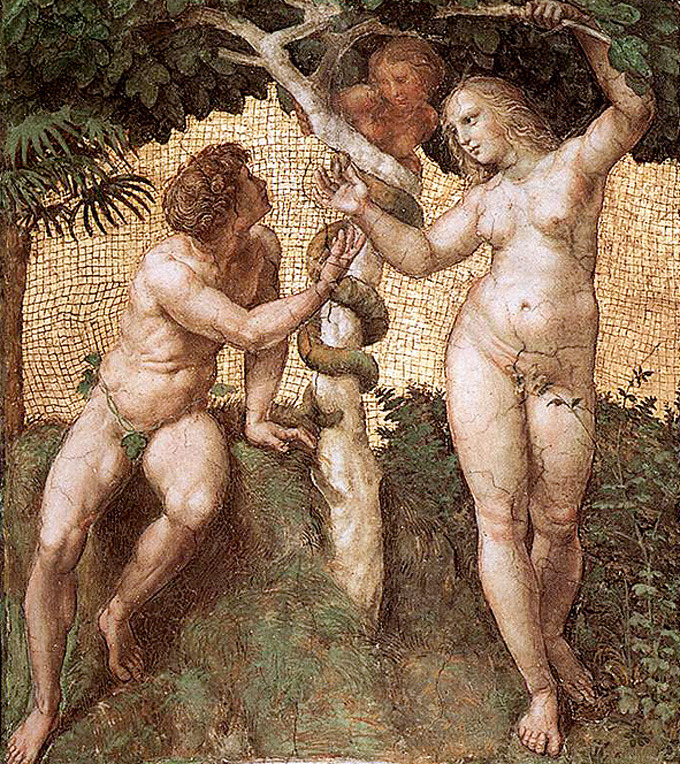 Yet, many consider this version to be one of the most disproportioned figures of the Renaissance, due to the figures' limbs and body parts being too long, too short or too big. Leonardo's work was a success because he began by drawing a perfectly proportioned man and then found the circle and square in the figure. The circle and square are only tangent at one place, the base. Leonardo's drawing was far more beautiful and based on ideas found in reality rather than the other way around. Vitruvian Man was owned by Giuseppe Bossi and he depicted it in his monograph on Leonardo's The Last Supper, entitles Del Cenacolo di Leonardo Da Vinci libri quattro (1810). The following year he selected the section of his monograph concerned with the Vitruvian Man and published it as Delle opinioni di Leonardo da Vinci intorno alla simmetria de'Corpi Umani (1811), and dedicated it to his friend Antonio Canova. After Bossi's death in 1815 the Vitruvian Man was acquired, along with the majority of his drawings, by the Accademia. 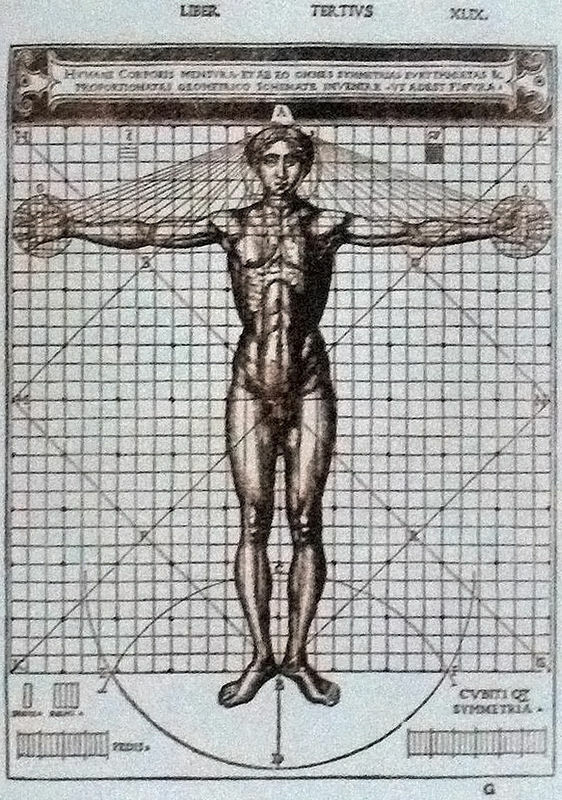 Da Vinci's understanding of both anatomy and geometry made him an ideal candidate to produce his drawing, Vitruvian Man. Vitruvius' book De Architectura set out a system of ratios for the construction of 'perfect' buildings that exhibited the author's three necessary principles of durability, usefulness, and beauty. His system proved a robust one and revived interest in architecture during the Renaissance. As Vitruvius believed that good architecture was essentially a continuation of the laws of nature, he demonstrated that his system applied to the formation of natural structures, including man, a theory shared by Leonardo. Despite the fact that Vitruvius' literature describing the perfect human form in geometrical terms influenced several of Leonardo' contemporaries, only he achieved a correct illustration of the proportions outlined. His resulting work went on to become one of the most recognized drawings in the world and a representation of the standard of human physical beauty.